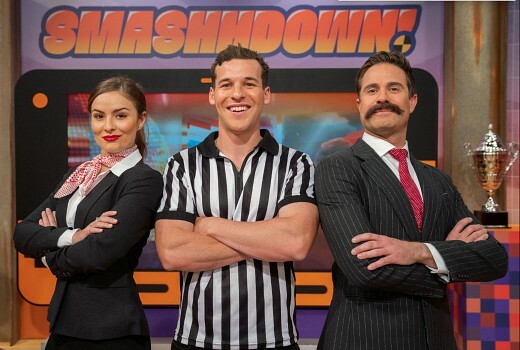 New Queensland-made kids’ series Smashhdown!, begins on 9GO! later this month hosted by former Block contestant and school teacher Andy Sunderland with Michael Balk (dirtgirlworld, BrainBuzz) as Glen Goosebump and newcomer Briana Goodchild as Glenda Goosebump. “Smashhdown! is the ultimate fast-paced sports game show for kids. It’s full of fun and I can’t wait to see who our first champion will be. Make sure you tune in to beat those school holiday boredom blues,” said Sunderland. “I am thrilled to be working on Smashhdown! It’s such an exciting new show with a stellar format: from the locker room to the lab, from the field to the laundry, no area of sport is off limits, so strap yourself in for a smashhing good tournament,” Balk said. “Stepping out from behind the camera and into the role of Glenda Goosebump has been one of the most rewarding experiences. Working alongside a seasoned professional like Michael Balk to bring our comedy commentator roles to life has been hilariously funny, and I can’t wait for kids across Australia to join in on the laughs,” Goodchild said. The first week of episodes also features New Zealand international rugby league player Alex Glenn, Aussie Diamond Gretel Tippett and Firebird Mahalia Cassidy, Aussie Rules rising star Alex Witherden, and Brisbane Roar winger Daniel Leck. 8am Monday December 17 on 9GO! and continuing weekdays.